Walking and cycling infrastructure from South Coogee to Kingsford is set for an upgrade, but local activism is giving the false impression that it involves large scale tree removal. 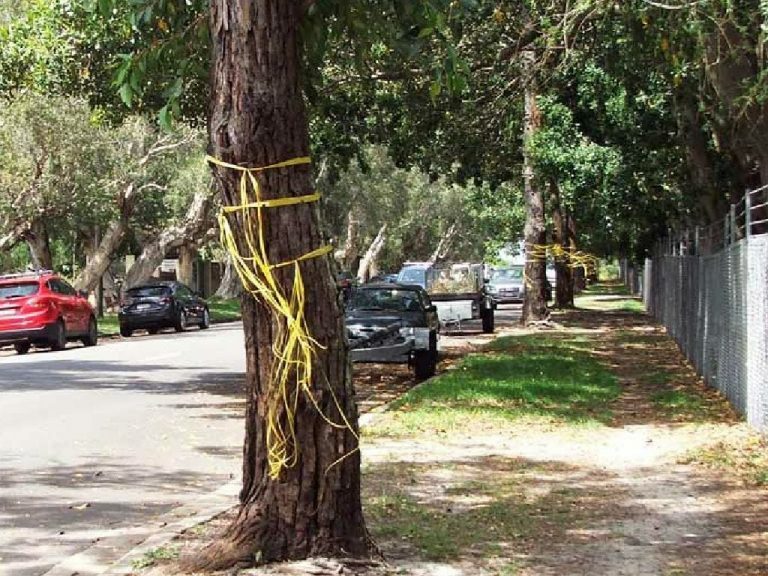 Red and yellow tape started appearing on trees along proposed routes for upgraded walking and cycling routes from South Coogee to Kingsford. Stories with photos like the one below appeared in the Telegraph and this created local concern that large numbers of trees would be removed as part of the upgrade. This tape was applied by a local activist not Council, and it does not reflect plans to remove trees. Some trees may need to be pruned as part of delivering the infrastructure, but this is no different to ordinary tree management in urban areas. The good news for the community is the proposed upgrades include planting more trees that will improve the local streetscape for walking and cycling in the area. “It’s a shame local activism has given people the wrong impression that lots of trees will be removed when this isn’t what’s happening,” said Bicycle NSW General Manager of Public Affairs, Bastien Wallace. Bicycle NSW commends the efforts of local government to provide high quality, safe infrastructure and a pleasant riding experience in order to encourage more people to choose active transport for their journeys.